We’re not talking Hansel & Gretel here — I mean real, true breadcrumbs. They are used unexpected ways in so many dishes in Sicilia. Well, at least in the parts of Sicily I’ve visited (admittedly few). Loving this country! Leaving Roma, a city in which I feel comfortable, and know how and what to order. In Sicilia, it is all new customs, food, and certainly all new types of people. If you are looking for something Siciliano-style, expect to find anchovies, pistachios, raisins, olives, capers, and, oh those breadcrumbs. I have had crumbs dusting perfectly grilled cubes of swordfish, coating vegetables and sprinkled on pasta. I am rushing out to meet my travel companions for the Villa Casale, but here is what we had for dinner. The waiters at Il Duomo in Taormina were kind enough to let us split the dishes up among ourselves. Sarde a Beccafico — Sicilian style stuffed sardines. The most delicate piece of that homely fish, stuffed with I am not sure what, served with a few jagged squares of roasted potatoes and a little slice or two of roasted red peppers. Verdure Selvatiche con Crostini di Pane — Sicilian Wild vegetables with croutons. Wild is right. It was the ugliest twist of some deep dark, stalky green with fronds I’ve seen. Scattered with chunks of delicious chewy croutons drenched in fruity olive oil. I *think* the green was wild fennel because it was licoricy and had those fronds. It was sheer ambrosia of the veggie persuasion. You just know they really did forage those greens. Pasta e Mollica — Pasta with anchovies, olives, capers and those ubiquitous breadcrumbs. Yum. Me. Oh, by the way, this general comment: if you think you’ve eaten caponata — think again!!! The mosaics await, gotta run. 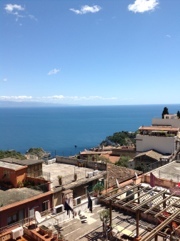 Sicily: a feast for all the senses. I’ve just arrived and am still processing what is and will be in this exotic Italian, but not really Italian, country. 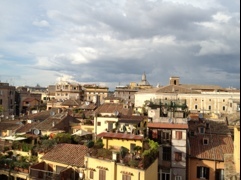 When I left Rome this morning, I was talking with the woman who owns the apartment in Monti where I rent “my” room. We were commiserating about the heavy thunderstorm that had drenched la bella città that morning. “Brutissimo!”‘ we agreed. “Will it rain like this in Sicily?” I asked. “It’s Africa!” said she. As if no more need be said. I am in the land of pistachios, mint and dried grapes. I am here to tell you: watch out when you’re hanging out with priests! I had the unexpected pleasure to discover I was in Rome with one of my best friends in the world — who happens to be a priest. 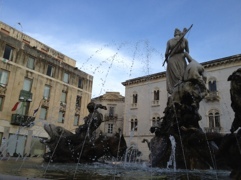 He was in town, staying at his Alma Mater in centro storico. 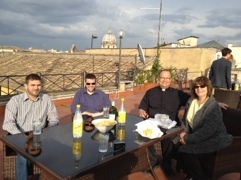 We started our evening with gin and tonics on the rooftop, warm, inviting and surrounded by a stunning view of Roma. St. Peters was just behind me. On the hour, the bells rang from every church in this city of a thousand churches. Beautiful sunset in Rome with fascinating people. This night, we dined at a cool little ristorante near the Campo dei Fiori. I ordered pasta e patate — which is pasta with potatoes. It was tomatoey, which I did not expect. And soup-like. I wondered aloud whether it would be redundant to sop up the sauce with bread. I only asked, of course. I did it anyway. After dolce, one of our priestly party told me about a kind of “darker” grappa. The waiter, who was alternately in our face, and absent when we needed him, told us it was called, in Italiano: Grappa Scura. Less lighter fluid, more smooth brandy. Yum. Me. I am morally, ethically, spiritually, physically, positively, absolutely, un-de-niably and re-liably in love. Certifiably. 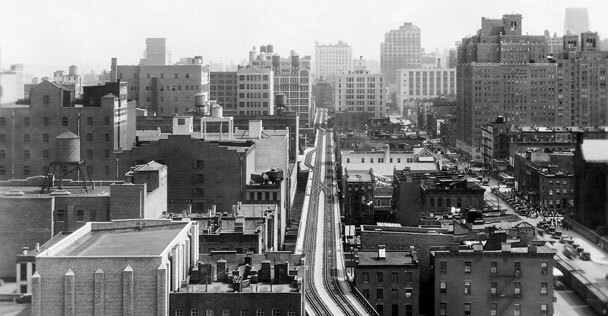 With the High Line, that is. That delightful park built upon the elevated track right next to the Hudson River, along the west side of Manhattan. Last week, Section 2 of the High Line opened up to the public. I have been waiting for just the right time to experience it myself. I usually walk in the early morning, both because it fits into my schedule and because there are usually very few people up there at that time. It always thrills me – whatever the season. But, man, they have dressed my High Line up for this particular moment. Like a grand dame all dolled up for the ball. The trees are lush, the flowers blooming, even the grasses are puffed up like peacocks.